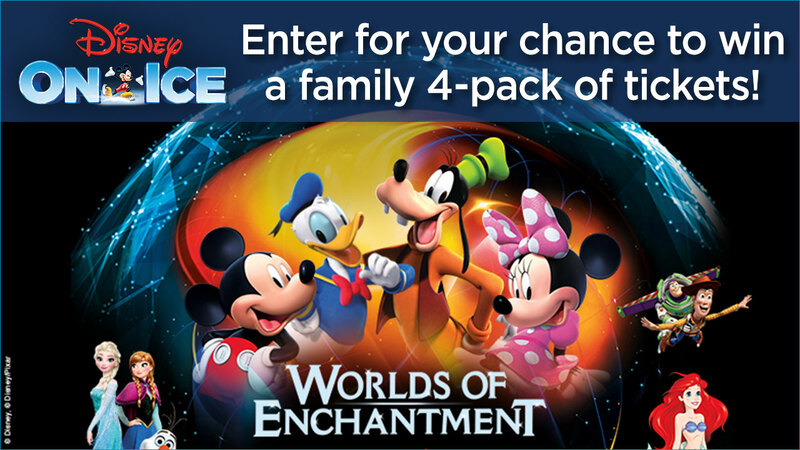 ABC7 wants to give you a chance to win tickets to see Disney on Ice "Worlds of Enchantment" at the Long Beach Arena! Enter the dazzling world of Disney magic, LIVE ON ICE! Rev up for non-stop fun with four of your favorite Disney stories at Disney On Ice presents Worlds of Enchantment. Thrill to high-speed stunts as Lightning McQueen, Mater and the crew of Disney. Pixar's Cars race across the ice! Dive into adventure with Ariel and The Little Mermaid's undersea kingdom. Experience the adventures of Buzz, Woody and the Toy Story gang as they race for home. Plus, enter the wintry world of Arendelle with sisters Anna and Elsa and pals Olaf and Kristoff from Disney's Frozen as they learn that true love comes from within. From wheels to waves, icy wonderlands to infinity and beyond, your family's favorite Disney moments come to life at Disney On Ice presents Worlds of Enchantment. For tickets or further information, visit https://www.disneyonice.com/. NO PURCHASE NECESSARY. Ends 4/10/19 at 2pm PT. Open to legal residents living within the DMA of KABC-TV who are 18 or older. Limit one entry per email per day. For full details including eligibility restrictions, odds of winning, prize description and limitations, see Official Rules at https://bit.ly/2HUNkrH. Void where prohibited.